The post Antifreeze Poisoning in Dogs — What You Need to Know by Sassafras Lowrey appeared first on Dogster. Copying over entire articles infringes on copyright laws. You may not be aware of it, but all of these articles were assigned, contracted and paid for, so they aren’t considered public domain. However, we appreciate that you like the article and would love it if you continued sharing just the first paragraph of an article, then linking out to the rest of the piece on Dogster.com. Antifreeze is an additive put into a vehicle’s engine cooling system to lower the water’s freezing point to reduce the likelihood of the vehicle’s cooling system freezing. It is also used to raise the boiling point of the engine coolant to prevent overheating. Antifreeze is good for cars — but dangerous to dogs. Here’s what to know about antifreeze poisoning in dogs. 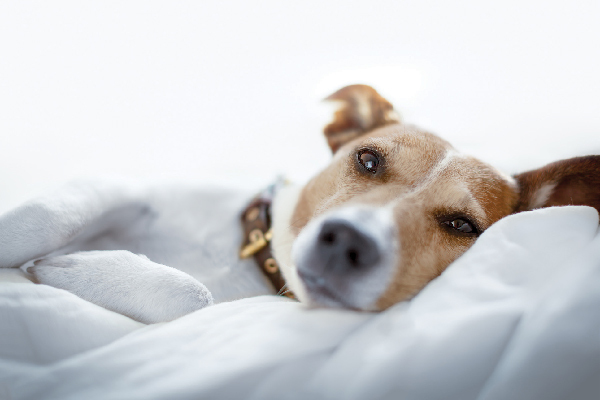 Antifreeze Poisoning in Dogs — Why Does It Happen? Unfortunately, dogs are attracted to antifreeze. Photography ©damedeeso | Getty Images. One of the biggest problems about antifreeze is that dogs are often attracted to it. Embrace Pet Insurance Claims Manager Rachel Hinder explains that dogs are attracted to the sweetness in the chemicals. Antifreeze is odorless and the main problem is the toxic active ingredient ethylene glycol. Keep antifreeze away from your dog at all costs. It’s extremely important to keep dogs away from antifreeze but what should you do if you think your dog got into antifreeze? Unfortunately, antifreeze poisoning is fast and serious. “Within 30 minutes of ingestion, dogs are lethargic, uncoordinated, hypothermic, can vomit, urinate excessively and drink excessively,” Rachel explains. This is when conditions for dogs can get very critical. “Thirty-six to 72 hours after ingestion, the kidneys shut down, which can cause abdominal pain, inability to produce urine, depression, lethargy, seizures, coma and ultimately can lead to death,” Rachel says. Seek veterinary care immediately if you even suspect antifreeze poisoning in dogs. At the clinic or hospital, the veterinarian will evaluate your dog, and run blood tests to determine if your dog was exposed to enough antifreeze to compromise his health and work with you to create a treatment plan. Dr. Stern explains that the priority with treating antifreeze poisoning in dogs is to prevent the dog’s body from metabolizing the ethylene glycol. If your dog is taken to the vet within the first one to two hours of antifreeze exposure, your vet will probably attempt to induce vomiting. Hinder explains that a dog will also likely receive IV fluids to help flush the body and maintain hydration status. In some cases, veterinarians are also able to give dogs exposed to antifreeze medications that may help counteract the effects of ethylene glycol. The prognosis for antifreeze poisoning in dogs really depends on how quickly a dog receives veterinary care, and how much antifreeze was consumed. “Ingestion of antifreeze containing ethylene glycol can be fatal if not treated immediately,” cautions Dr. Stern. Since ethylene glycol acts so fast, a lot of damage can be done very quickly after a dog gets into antifreeze. Antifreeze Poisoning for Dogs — What Dogs Are Most at Risk? While antifreeze is extremely dangerous to all dogs, Rachel explains that any dog who already has a decreased kidney function will be at a great risk of complications from ethylene glycol toxicity. Also take special care with inquisitive, destructive and young puppies who are more likely to be curious and explore areas where they could come into contact with antifreeze. “Even a small amount can be fatal, so any exposure warrants a call to your vet or the ASPCA Animal Poison Control Center,” advises Dr. Stern. How Can You Avoid Antifreeze Poisoning in Dogs? For many of us, having antifreeze on hand is a fact of life, but there are precautions we can and should take to make sure that keeping our cars running well doesn’t pose a health risk to our dogs. Hinder encourages all dog guardians to be very cautious when using and storing antifreeze as well as brake and transmission fluids. In addition to being thoughtful about how and where you store your antifreeze, it’s important to clean up spills, leaks or drips as soon as possible to prevent your dogs from exploring this dangerous fluid. Dr. Stern suggests that there are even some pet-safe antifreezes on the market now. These products typically contain propylene glycol as the active ingredient, which she describes as having a much wider margin of safety. However, even these “pet-safe” antifreeze products will still cause medical complications if a dog ingests large amounts. Stay on the safe side and keep your dog away from all chemicals. Thumbnail: Photography © Milan_Jovic | iStock / Getty Images Plus.